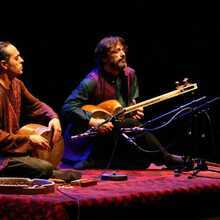 An extraordinary encounter of two absolute masters of Persian classical music: Hossein Alizadeh and Madjid Khaladj. Hossein Alizadeh was born in Teheran in 1950. 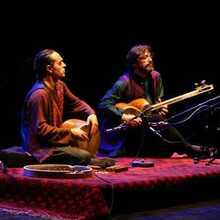 He became one of the major exponents of the contemporary Iranian music. He studied the classic Persian composition system, the Radif, with masters such as Hooshang Zarif, Ali Akbar Shahnazi, NurAli Borumand, Mahmood Karimi, Abdollah Davami, Yousef Foroutan, and Saied Hormozi. He recorded the complete Radif repertoire, based on the interpretations by Mirza Abdullah for tar and setar. 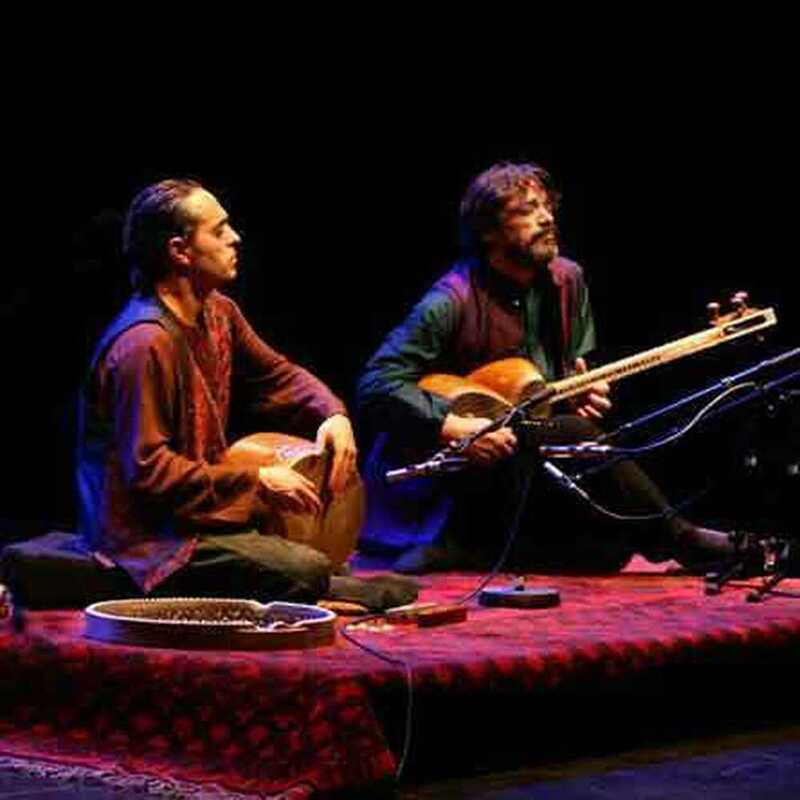 Alizadeh studies music compositions and performance at the University of Teheran followed by compositions and music sciences at the University of Berlin. He was a teacher at the University and the conservatory of Teheran. He was conductor and soloist in the Iranian National Radio and Television Orchestra. 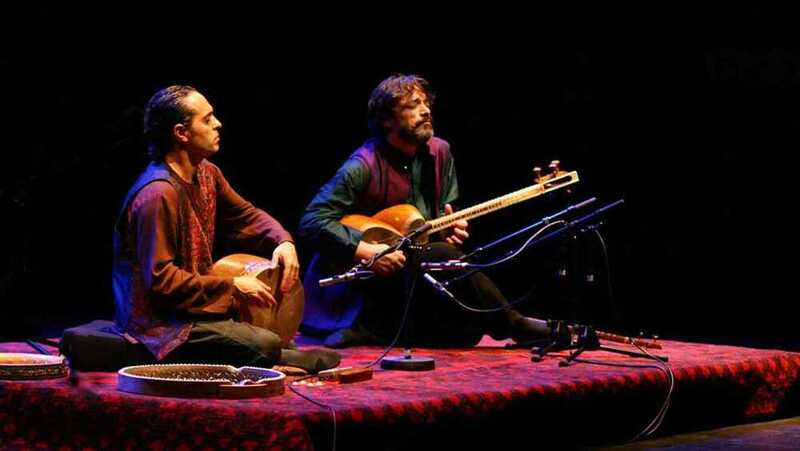 He is the founder of the famous Aref Ensemble and he also worked several times with the Shayda. His most famous works are: The Nava Improvisations (1976), Riders of the Plains of Hope (1977), Hesar (1977), Revolt (1983), Ney Nava (1983), Dream (1986), Torkaman (1986), Raz-O-Niaz (1986), Delshodegan (1987), Song of Compassion (1991), New Secret (1996), A Time for Drunken Horses (2000), Turtles can Fly (2004), Endless Vision (2004), Nive Mang (2006), Under the Razor (2007), Ode to Flowers (2007) and Echoes of Light (2009). The latter was nominated for a Grammy Award in 1996( Category Best World Music Album). Madjid Khaladj was born in Ghazvin in 1962. Madjid Khaladj started studying tombak when he was seven. He is unanimously acknowledged a one of the biggest masters of Iranian percussion. He is most active internationally, and performed during the most renowned festivals worldwide. He cooperated with amongst others Ry Cooder and Lisa Gerrard (Dead Can Dance). In 1984 he went to teach at the Center for Middle Eastern Music Studies at the Institute of Musicology of the Sorbonne, which was lead at that time by Yehudi Menuhin. In 1996 he founded the Ecole de Tombak in Paris and since 1998 he also teaches at the Cité de la Musique in Paris and at the State Academy of Music in Basel. The unequaled beaty of his style, the mastery of his rhythms, and of his spontaneous creations do not only place him alongside the great classical Persian masters, but also distinguish him as one of the important figures in the world of percussion. A few of Khaladj most remarkable works are: Anthology of Iranian Rhythms, Vol. I (1997) & Vol. II (1999), Iranian Percussions (2000), Nafas/Iranian Art Percussion (2006),beside the recordings he made together with o.a. Hossein Alizadeh, Hossein Omoumi, Dariush Talai, M.R. Lotfi en M.R. Shajarian.